Who needs a Chromebook when you can get full Windows for the same price? Lenovo’s Miix 320 is a $199 Windows laptop that could have a chance of combating cheap Chromebooks. While HP’s Stream devices are a decent stab at the same effort, the Miix 320 includes various features that help it feel a little special, even if it’s still a pretty bare-bones machine. 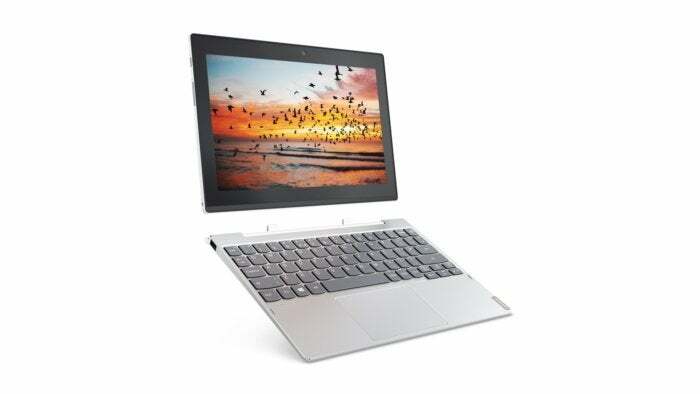 Announced Monday at Mobile World Congress, the laptop will ship in April, with a pen-enabled version coming in July. The Miix 320’s best feature is its form factor: a 2-in-1 detachable laptop, which doesn’t exist among Chromebooks (the ones with 360-degree hinges don’t count). There’s a secure, but easily released magnetic joint between the display and keyboard halves, and the 10.1-inch display is light enough to hold easily as a tablet. The screen is a little smaller than the typical Chromebook’s 11-inch display, but its 1920x1200 resolution is noticeably finer than the crummy old 1366x768 spec you find on most of those larger screens. The display half of Lenovo’s Miix 320 includes a USB-C port (and don’t worry, there are USB-A ports in the keyboard half). I didn’t have much time to use the keyboard, but my first impression is that it might be a step up from the worst Chromebook keyboards, whose hard plastic buttons make me feel like I’m typing on rocks. I’m more intrigued by the built-in Microsoft Precision Trackpad, which recognizes some additional touching and swiping gestures for easier navigation through Windows 10. 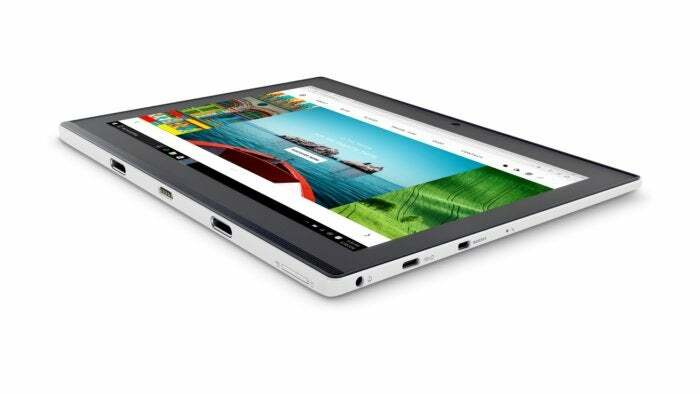 Connectivity often suffers in laptops this small, but the Miix 320 struck a thoughtful balance. It looks to the future with one USB-C port on the display half, and it tucks two USB-A ports into the keyboard half to let us all use the legacy devices we hate to give up. You also have an LTE option, so you really could use it just about anywhere. Lenovo’s Miix 320 uses a Microsoft Precision Trackpad for more versatile touch controls. Here’s the bad news: The Miix 320 comes with a mere Intel Atom X5 (Cherry Trail) processor, which means you’ll need to stick to web-browsing and a few mainstream applications—nothing fancy. On the other hand, this CPU gives you great battery life, up to 10 hours from a full charge. You also get 4GB of RAM and up to 128GB of eMMC storage, though please note that unlike with Chromebooks, you need to save some room for your Windows OS—20GB for the 64-bit version. We don’t know whether the Miix 320 will be able to rise to chip away at Chromebooks’ market share. 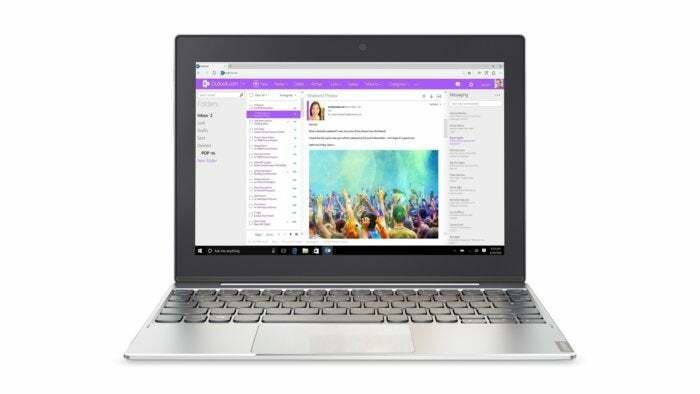 Chromebooks exist in part because it’s difficult to accommodate Windows 10 in a low-end laptop. On the other hand, I couldn’t be the only person who suffers and swears when I attempt to be productive on my smartphone. The upshot is that a small, light Windows machine like the Miix 320 could give me the screen and keyboard I crave in an easily carried device. Indeed, if I got the LTE model I wouldn’t have to tether my phone or take my chances with public Wi-Fi. I’ll be sure to let you know what it’s like if I get one in for review.